There are so many people on right now. Last edited by Whizbang on Mon Jul 08, 2013 9:12 pm UTC, edited 1 time in total. BlitzGirl wrote: Looks vaguely like Hiragana, but I have no idea if these are actual Hiragana characters. The second one does look like "so" (http://en.wikipedia.org/wiki/そ). Last edited by FullOfIt on Mon Jul 08, 2013 9:13 pm UTC, edited 1 time in total. Eutychus wrote: Is it part of the Voynich manuscript? My thoughts went there... right after the music, and I don't think so, based on one photo of a page I pulled up, but I'm no expert. But Voynich would make so much sense, and be rather unhelpful. The first and last symbols are mirrors of one another, except for that degree-looking dot. (Or could do fry sauce instead). Without sleep, I can't think. TimeWaiter feel humble, but try. TimeWaiter like cake and cupcakes too! Try to make decree nice. We're too busy for that. Raptors too, just in case. We all thank edfel's map. We hear the "chirp"s and "Pffthh"s and "Pthuh"s and "bye"
And we hear Megan's THWAP. No. Nor are they katakana, kanji, Korean or Chinese. I just checked. Nothing like it in the Voynich Manuscript, nor in The Codex Seraphinianus. I think I'd need more samples before I can take a stab at a lexical analysis. And it's definitely not Klingon. Last edited by libra on Mon Jul 08, 2013 9:24 pm UTC, edited 1 time in total. Last edited by Eutychus on Mon Jul 08, 2013 9:18 pm UTC, edited 1 time in total. A representation of my idea of related languages sinking. If this is at all based on cursive Hebrew, I can recognize four of the letters. 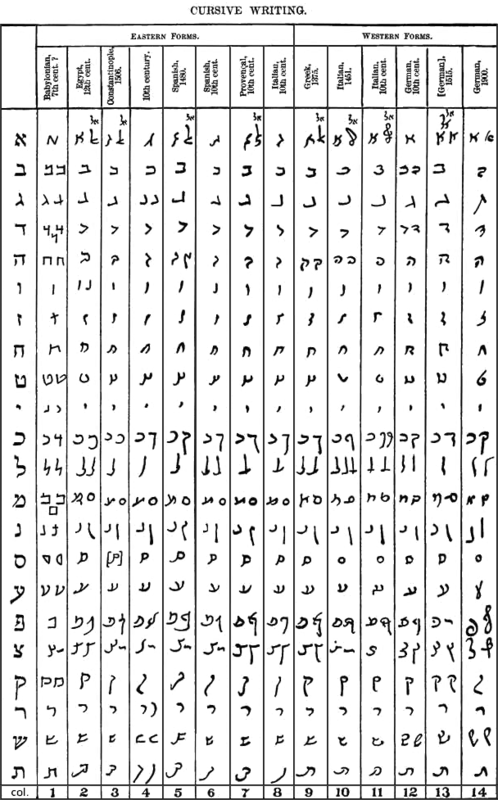 The first letter (right to left, as Hebrew is generally read) could be a zayin, the second word's first letter is possibly a tet, the second letter of that word would be daled, and the final letter would be gimel. However, Hebrew would only make sense if combined with something else, since the second letter of the first word (assuming right to left reading) is not a letter in Hebrew at all, not even with wild extrapolations like those needed to call the first letter a cursive zayin. 7, another of my predictions seems to be coming true! I agree that one of the characters looks like そ, but none of the others are hiragana. BlitzGirl wrote: It's nice to have more Knights Temporal about. And fitting that the knightings should happen during the Long Night of the OTC. So, does that mean that Kdawnings are in order now? Well, that proves it! GLR does read the thread! Or that the pitch is to be lowered one half-flat (half flat to full flat) over the course of the phrase. The problem is that the drawing of the Voynich characters in that comic are pretty spot on, and these would have to be pretty approximate to fit. How about "I seem to be having tremendous difficulty with my lifestyle"? I was actually thinking of that very quote, but I wan't sure of the exact wording and couldn't be bothered looking it up, so I just started the phrase in the same manner and then continued with whatever monkey-taco-pseudorandom nonsense I happened to think of. Towels were naturally not far from my mind. BlueCrab wrote: Any opinions on which atmosphere would take more time, and more effort, to terraform? My money's on Mars being faster, but I have no real basis for thinking that. Would that be with the Mark II or Mark III Teraformer? Well U+202c didn't work, and now I am out of ideas. I think the key to discovering this language may start with identifying what language use that kind of open & closed inquisitive marks. I'm looking right now, but I don't know much about this kind of thing. Sounds like you have a tentative argument here. If the same structure appears in a future frame, with different characters between them, then this would be a reasonable conclusion. Roll on more data. Mongo cool! 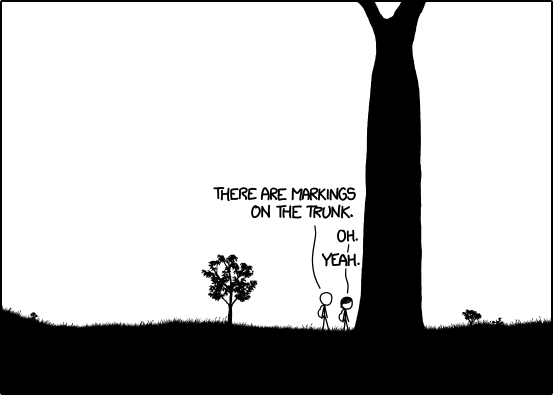 (that's like "neat", only moreso). Also neat is that Jonathan Coulton does a song a week... all GPL. That's a lot of new songs! Wonder if he'd be interested in seeing your ottification - he sounds like somebody who would enjoy the thread. Nah. They are saying that their hovercraft is full of eels. (the "problem...lifestyle" quote seems to have some mememity... hmmmm. edit for tag fail. Twice. Last edited by ucim on Mon Jul 08, 2013 9:40 pm UTC, edited 2 times in total. LoonieSpace wrote: Hmmm. A couple characters look like Hebrew script and at least one character looks Greek but otherwise looks gibberish-y to me. I think the first person said, "You're a scarecrow, you should eat something." Last edited by sford on Mon Jul 08, 2013 9:49 pm UTC, edited 1 time in total. Hebrew? First looks like gimmel, last like zain? At this point, it would not surprise me if GLR took symbols from four or five different scripts, mustarded them up a bit, and used that as Beanie-ish. Blintz continues. BlackCat flight now passing NP1029, have crossed shadow post from the past. Progress and arrival delayed to encountering extreme headwinds from Outside. Continuing on course as filed; unable to predict arrival due to slow travel and destination moving farther away. CameronCat wrote: PIREP: Unusual music heard over comms vicinity NP1002. Slightly clipped British accent, easy beat, plenty of boom de yadas. Loved it. The audio is great. My term "clipped" refers to your particular British accent and the way you handle certain vowels and final consonants. It is neither the broad (or posh) version nor the nasal twang of, say, Manchester or --Randall help us! -- Glasgow. I'm guessing you're perhaps from the Midlands? And I utterly, completely lost it. I'm still out of breath. For all you have contributed to this congregation and the Tabernacle, I am happy to have brightened your day a bit. BlackCat flight proceeding, with Information Ucim. Anticipate straight-in approach perhaps to November Papa one zero three eight or three nine. Last edited by CameronCat on Mon Jul 08, 2013 9:49 pm UTC, edited 1 time in total. Back from t'outside. Ooh, weird other language! If Beanie-ish is indeed a completely fictional language, that makes it pretty much certain it's set far in the future OR in a strange Randallverse. Megan wrote: We won't eat you. Which in due process will unfortunately become mistranslated as "We won't your "
Rule110 wrote: "... ho, it's off to work we go"? I thought that "Heigh-Ho" was pronounced "Hi-Ho," not "Hey-Ho." Who can say for sure? Mysterious are the ways of the Dwarves. 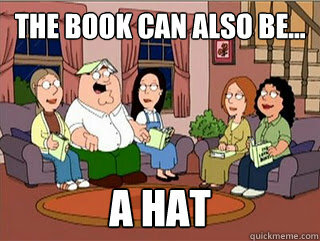 k.bookbinder wrote: If my hat can be a book, then there is no excuse for unoriginality, regardless of lack of resources. But yes, their uniform-ness does suggest minions or sorts, doesn't it. yappobiscuits wrote: Randallspeed on your blitzquest, Minim! You can do it! *returns salute* What ho, Minim of the future when you eventually read this! Hmm, my sigcouragement did have a slight militaristic air to it I suppose... Good show, pip pip, carry on! CameronCat wrote: The audio is great. My term "clipped" refers to your particular British accent and the way you handle certain vowels and final consonants. It is neither the broad (or posh) version nor the nasal twang of, say, Manchester or --Randall help us! -- Glasgow. Nope, Cumbria (Far north-west, on border with Scotland). I don't have a particularly strong accent for the area though. I've been trawling through Unicode code sheets, and I can't find a set that includes all of our mysterious characters. If they are a real language (not invented by GLR, that is), it would either a) have to be one where the written form can vary significantly (which is many, to be honest) or b) one not represented in Unicode. The closest I came was aboriginal Canadian syllabics, but I really don't think they match well. BlitzGirl wrote: At this point, it would not surprise me if GLR took symbols from four or five different scripts, mustarded them up a bit, and used that as Beanie-ish. I'd generally agree. I wish he didn't mustard them up, because then we could use them as they were in the OTT. As it is, I tried matching most of them up to no avail (or, at least, not close enough to satisfy me). By Crikey, you could be onto something there! If they did read those words, she most likely never heard the language - and while we are reading those characters, we neither know what they sound like, nor does Megan have access to the written script in that speech bubble. What if these people cleared out this area, and erected those towers to eavesdrop and monitor the people below? Think it was a prelude to something like an invasion? It could, of course, be the case that Beanong is actually a perfectly normal current-earth language – might as well be Dutch – but simply one that Cuegan doesn't know. 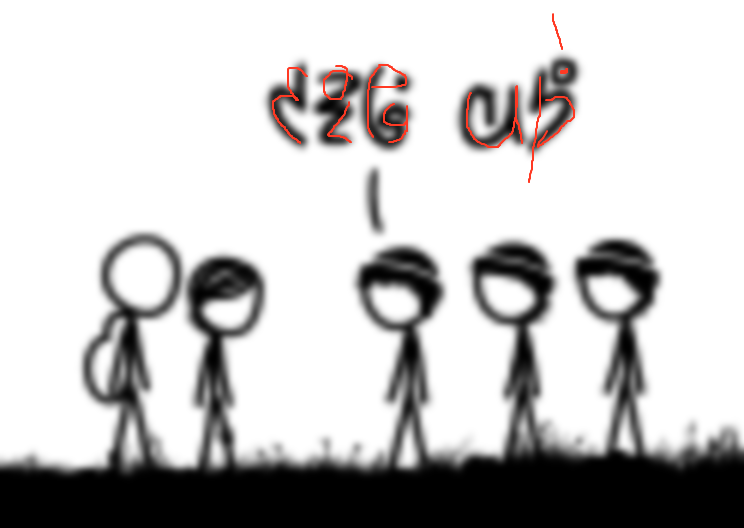 So, they hear gibberish, and thus we see gibberish. I'm going to say that I think this is a real language, although it may be an obscure one. 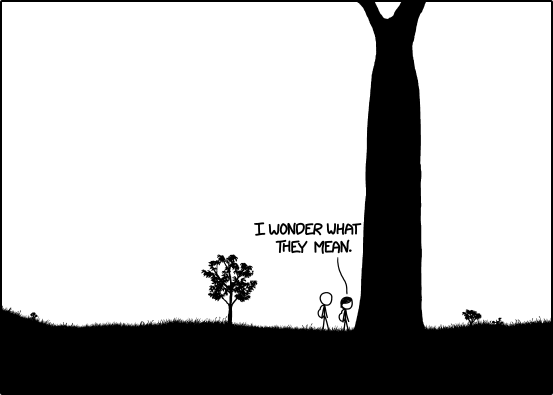 We need to get a picture of this on some linguist forum and see if someone recognizes it. Last edited by spamjam on Mon Jul 08, 2013 9:56 pm UTC, edited 1 time in total. I examined all the unicode transliteration tables and there is no match. There are some close calls, like Tibetan and Amharic, but no match. CasCat wrote: Cueball can climb faster because his leg isn't injured. I wonder if they'll speak the same language as the people she sees. "Hello. My leg is hurt. Can you help?" With thoughts of your own! Last edited by CasCat on Mon Jul 08, 2013 9:58 pm UTC, edited 1 time in total.